As kids, we’re taught the fundamentals of dealmaking: Listen, understand the other person’s point of view, be willing to compromise. The rules don’t change. But when those lessons aren’t properly absorbed in childhood—or when stress strips away our higher-level reasoning—even C-suite discussions can devolve into unproductive standoffs. Fortunately, the same tactics that parents and preschool teachers use when brokering bitter playtime fights can be successfully applied to negotiations between adults. For an edge in your next challenging negotiation, don’t think like a child—think like an adult talking to a child. “It would be hard for me to think of anything you could learn in childhood through negotiation that wouldn’t transfer to adulthood,” said William Ury, author of Getting to Yes and co-founder of the Harvard Program on Negotiation. In 2012, Google embarked on a five-year, multi-million dollar effort to identify the traits of a productive working team. It found exactly one constant among the divergent groups they studied: The most effective teams had high levels of “psychological safety,” which means that members felt mutual respect, trust, and comfort voicing their opinions, the New York Times reported. Essentially, teams are most productive when everybody plays nice. In practical terms, that means being able to see past your own objectives long enough to understand what the other party wants, why they want it, and why it’s important to them. The problems behind kids’ immature conflicts—lack of empathy, and an all-or-nothing style of thinking—can stymie adult negotiations too. “People who know how to manage conflicts well, whether [they are] preschool teachers or mediators, are able to hear what is going on with that child or adult: that their needs aren’t being met,” said Lisa Maxwell, director of the Training Institute at the National Conflict Resolution Center in San Diego. Arrive at a mutually acceptable solution. In 2010, a team of researchers observed 67 families to study conflict resolution within and across generations. They found, not surprisingly, that conflicts between parents and children tended to have a win-lose outcome: parents pulled rank. Standoffs were more likely between siblings and spouses, where the power dynamic was more equal. But they also found that negotiations between adults and children were in some ways more productive than those between adults. With their children, parents spent more time working on productive, future-oriented solutions (“How can we work this out?”). With their spouses, they often engaged in the kind of oppositional behavior that solves nothing (“Seriously? You think that’s a good idea?”). In other words, when dealing with children, adults know it’s their responsibility to set a good example. When dealing with another adult, all of that can be forgotten. The difference between stalemate and successful resolution can be remembering that each party has a duty to find a mutually acceptable solution rendered in respectful terms. 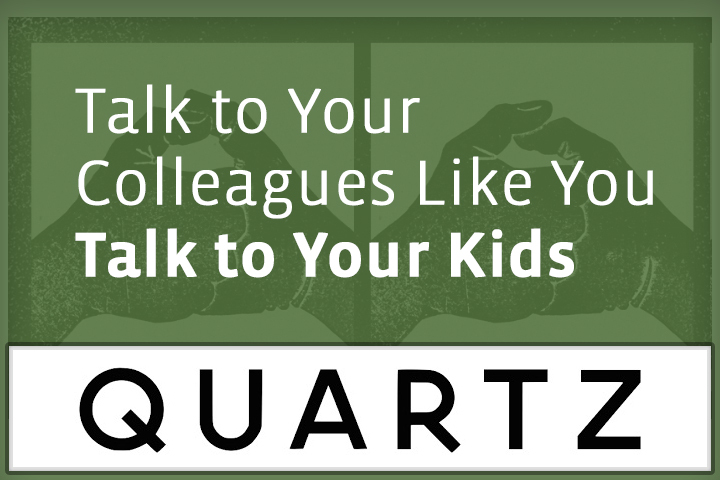 No Replies to "To Be a Better Negotiator, Talk to Your Colleagues Like You Talk to Your Kids"